Netbooks are universally regarded for their portability, but no two netbook models are exactly alike, and each seems to come with different trade-offs. A netbook with a superior battery might have a horrible keyboard arrangement; a netbook with a solid-state drive might slip out of your price range; a netbook with a killer list of specs might be missing 802.11n connectivity. These are all common problems--and you won't find common solutions. Due to their diversity, netbooks don't share common upgrade paths as typical desktop PCs do. Each model is unique in what you can do to it, and the exact procedures for modifying your device are as varied as the netbooks themselves. If you want to upgrade your machine, we recommend that you hunt down the instruction manual or, in the case of trickier upgrades, a community of users who can walk you through the process of modifying and hacking new functionality into your extremely portable PC. That said, you can make a wealth of netbook customizations, and they range in difficulty from 5-minute routines to soldering-gun-based surgeries. We'll take you through some customizations for a Dell Mini 9, as it's one of the more tweakable netbooks we've come across. While your mileage (and procedures) will vary with your own netbook model, this guide will give you a good idea of the kinds of upgrades that could be possible for your machine and skill level. In our testing the Dell Mini 9's battery lasted around 3 hours, 34 minutes. That's not too shabby for a four-cell battery, but you can do better. Though you may find a few guides online that teach you how to create a laptop battery using a number of aftermarket batteries all wired together, that's a recipe for disaster. Instead, look to eBay: There you can pick up a 77-watt-hour, eight-cell battery that's entirely compatible with the existing connections (and size) of your Dell Mini 9. You'll double the longevity of your netbook--provided you aren't bothered by the unruly mass sticking out from underneath your system. 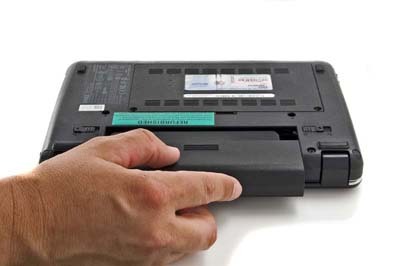 To replace the battery, flip your netbook upside-down and move the two switches from the locked icon to the unlocked icon, and push up on the battery tray. 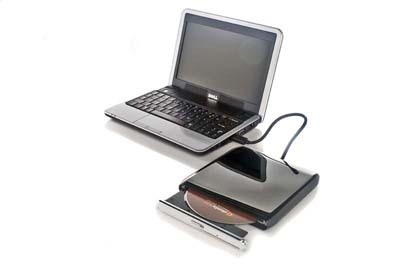 If you want to install a new operating system onto your netbook, you certainly can: Just pop the CD in any external USB optical drive and install away. Want to dual-boot your netbook? Grab the GParted utility, by downloading the .iso file for its LiveCD and burning the file onto a disc. Insert that disc into the external optical drive, restart your netbook, and jump into the BIOS to change the boot settings for your machine. Boot off of the optical drive first, and GParted will load. Right-click on the primary partition and select Resize/Move. Microsoft recommends at least 16GB of space for Windows 7; if you were hoping to use that OS but your netbook doesn't have that much room, your experiment ends here. For any OS, if your netbook does have space for it, enter a new partition size of your choosing. Click Resize, and you'll see the newly unallocated space sitting to the right of your primary partition in GParted's graphic. Right-click on this area and select New. Enter zeros for the 'Free Space Proceeding' and 'Following' selections, select Primary Partition under 'Create as', and click the add button. If you prefer not to use an external optical drive, you can follow these steps for using GParted and installing the new OS with a simple USB thumb drive. Is the default layout of your netbook's keyboard conflicting with the muscle memory you've built for desktop keyboard layouts? 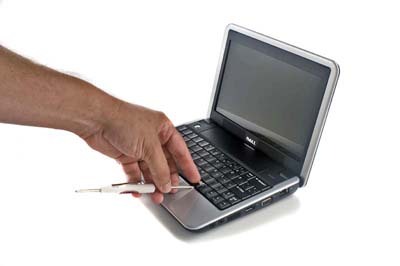 Pop an offending key off of your netbook by wedging a tiny screwdriver under the key and gently applying upward pressure. As long as the keys you're swapping around are of the same size, you'll be able to interchange them as you please. Once you've made the physical transformations, use the Sharp Keys utility to reassign how your operating system interprets the keystrokes. If you don't mind a bit of visual confusion, you could leave the physical keys exactly where they are and simply redefine their purpose with this helpful application.